I am a sucker for challenges, especially of the kind that goes something along the lines of “do x for y number of days in a row”. So when I stumbled upon a challenge on Facebook to join the #BusinessBoomUtmaning (utmaning means challenge in Swedish) which challenges me to post a Facebook live-video every day between the 1st and 21st of November, I was game! The group is in Swedish, but I chose to do my challenge in English, and I also decided to have Coaching as the theme for the entire gig. Every day since November 1th I’ve created a short Facebook Live-video, and I have every intention of fulfilling my obligation to myself of running the course. And since it’s a daily challenge for 21 days, it’s easypeasy as well – because it means I know that every day I am to do a Live. I don’t have to wonder if “it’s today or not”, because it is. Every day. For twentyone days. 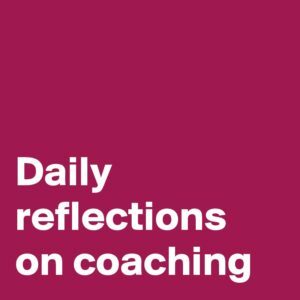 My choice of theme gives me ample opportunity to reflect upon what Coaching means. For me. And for my clients – at least what they share with me. Additional perks is learning to do FB Live:s, get me in the habit of doing videos, get better at talking directly to the camera, get thinking of coaching more specifically, get more to blog about (because whatever I reflect upon most likely can be turned into a blog post) and as icing on the cake, it’s great fun to keep tabs on how many views each video gets. Do you enjoy this type of challenge? Or do you abhor them?